Fantasy Flight Games is proud to announce that the ultimate celebration of Lovecraftian Horror returns with Arkham Nights 2018, which will be held at the Fantasy Flight Games Center in Roseville, Minnesota on October 19 – 20! You can purchase your tickets for the event here, and read on to learn about the horrors and thrills that await! This bone-chilling two-day event is the ultimate destination for seekers after horror, offering participants the chance to play demos, receive exclusive gifts, and meet the masters of madness who bring the Arkham Horror Files games to life. 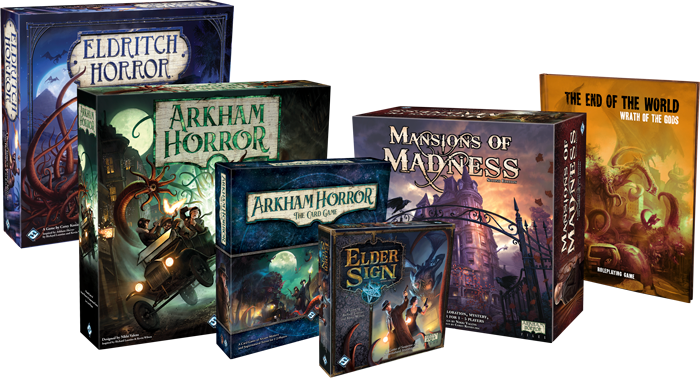 At Arkham Nights 2018, you can celebrate Lovecraftian horror in all its forms, as the event will feature both classic games and new adventures. Here, you’ll have the chance to experience demos and playthroughs of Eldritch Horror, Elder Sign, Mansions of Madness, Arkham Horror: The Card Game, End of the World: Wrath of the Gods, and have a chance to look beyond the veil with previews of the highly anticipated Arkham Horror Third Edition! You will also have a chance to experience the thrilling final chapter of a two-part scenario for Arkham Horror: The Card Game. This scenario, which began with The Eternal Slumber at Gen Con Indy earlier this year, has already been shaped by the results of the previous investigation, and Arkham Nights 2018 is your chance to leave your mark on the game. While The Night’s Usurper will have a wide release at a later date as part of Guardians of the Abyss, this event holds a special weight, as the final outcome will shape the future of Arkham Horror: The Card Game. Based on the results of this event, one of three possible basic weaknesses will be added to a future product. Will you be able to lessen the blow for your fellow investigators, or will your actions doom the world to a terrible fate? Beyond the games themselves, Arkham Nights 2018 will also feature special guests Richard Launius (the original designer of Arkham Horror), the designers of Arkham Horror: The Card Game, Matt Newman and Nate French, and more! But that’s not all—some designers will be leading “Play with the Designer” sessions and other special events. You will have the rare chance to play some of your favorite Arkham Horror Files games with those who created them, like the first edition of Arkham Horror with Richard Launius on a giant board. Then, on Friday night, seats will be raffled off to design a card for Arkham Horror: The Card Game in a Card Council with Matt Newman and Nate French, granting you a rare glimpse into the deranged minds behind the Arkham Horror: The Card Game. The cards designed at Arkham Nights 2018 will be printed and distributed to all attendees before the end of the event, so that even if you aren't chosen for the Card Council, you can still bring a small totem of remembrance when you are relinquished to the cold and cruel world. To commemorate your journey into the unknown, all Arkham Nights 2018 attendees will also receive a gift bag filled with Lovecraftian loot. You will gain an exclusive 6” by 9” black velveteen bag, emblazoned with an eldritch emblem, as well as a collection of acrylic health and sanity tokens, a set of Arkham-themed dice, a preview character from Arkham Horror Third Edition and one from Elder Sign, along with a deck box and a copy of The Night’s Usurper Scenario Pack for Arkham Horror: The Card Game before its wide release. These mementos may be all you have to prove that what you witnessed at this horrifying event truly happened—be sure to keep them safe. Mark your calendars! The nightmare begins when the doors open at 4:00 P.M. on Friday, October 19, and continues until the final stroke of midnight on Saturday, October 20. Steel your nerves and prepare to stand against dark forces unlike anything you have ever seen! We’ll be waiting. To attend Arkham Nights 2018, you can purchase your ticket for the event here! Arkham Nights 2018 is a weekend of Lovecraftian horror, celebrating your favorite board games set in the Mythos! Here, you'll have the chance to demo new games, play with designers, pick up exclusive swag, and preview The Night's Usurper scenario for Arkham Horror: The Card Game before anyone else!